A physician ought to have his shop provided with plenty of all necessary things, as lint, rollers, splinters: let there be likewise in readiness at all times another small cabinet of such things as may serve for occasions of going far from home; let him have also all sorts of plasters, potions, and purging medicines, so contrived that they may keep some considerable time, and likewise such as may be had and used whilst they are fresh. In Prose Quotations from Socrates to Macaulay (1876), 536. And I do not take my medicines from the apothecaries; their shops are but foul sculleries, from which comes nothing but foul broths. As for you, you defend your kingdom with belly-crawling and flattery. How long do you think this will last? ... let me tell you this: every little hair on my neck knows more than you and all your scribes, and my shoebuckles are more learned than your Galen and Avicenna, and my beard has more experience than all your high colleges. 'Credo', in J. Jacobi (ed. ), Paracelsus: Selected Writings (1951), 80. And yet I think that the Full House model does teach us to treasure variety for its own sake–for tough reasons of evolutionary theory and nature’s ontology, and not from a lamentable failure of thought that accepts all beliefs on the absurd rationale that disagreement must imply disrespect. Excellence is a range of differences, not a spot. Each location on the range can be occupied by an excellent or an inadequate representative– and we must struggle for excellence at each of these varied locations. In a society driven, of ten unconsciously, to impose a uniform mediocrity upon a former richness of excellence–where McDonald’s drives out the local diner, and the mega-Stop & Shop eliminates the corner Mom and Pop–an understanding and defense of full ranges as natural reality might help to stem the tide and preserve the rich raw material of any evolving system: variation itself. During my pre-college years I went on many trips with my father into the oil fields to visit their operations. … I puttered around the machine, electronics, and automobile shops while he carried on his business. Both of my parents are inveterate do-it-yourselfers, almost no task being beneath their dignity or beyond their ingenuity. Having picked up a keen interest in electronics from my father, I used to fix radios and later television sets for fun and spending money. I built my own hi-fi set and enjoyed helping friends with their amateur radio transmitters, but lost interest as soon as they worked. Remarks on how his high school interests foreshadowed his career as a radio astronomer. From autobiography in Stig Lundqvist (ed.) Nobel Lectures, Physics 1971-1980 (1992). It is better to have a few forms well known than to teach a little about many hundred species. Better a dozen specimens thoroughly studied as the result of the first year’s work, than to have two thousand dollars’ worth of shells and corals bought from a curiosity-shop. The dozen animals would be your own. Lecture at a teaching laboratory on Penikese Island, Buzzard's Bay. Quoted from the lecture notes by David Starr Jordan, Science Sketches (1911), 147. Lives with no more sense of spiritual meaning than that provided by shopping malls, ordinary television, and stagnant workplaces are barren lives indeed. The knowledge we have aquired ought not to resemble a great shop without order, and without inventory; we ought to know what we possess, and be able to make it serve us in our need. 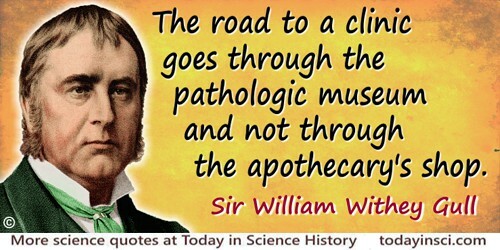 The road to a clinic goes through the pathologic museum and not through the apothecary's shop. Quoted without further citation in The New Encyclopedia Britannica (1986), Vol. 5, 566. You are still sending to the apothecaries and still crying out to fetch Master Doctor to me; but our apothecary’s shop is our garden and our doctor a good clove of garlic. In The Great Frost of January 1608, originally published in the English Garner (1877-1890). Collected in Edward arber and Thomas Seccombe (eds. ), Social England Illustrated: A Collection of XVIIth Century Abstracts (1903), 167. “True is it, my incorporate friends,” quoth he, “That I receive the general food at first, Which you do live upon; and fit it is, Because I am the storehouse and the shop Of the whole body. But, if you do remember, I send it through the rivers of your blood, Even to the court, the heart, to th’ seat o’ th’ brain; And, through the cranks and offices of man, The strongest nerves and small inferior veins From me receive that natural competency Whereby they live. And though that all at once”— You, good friends, this says the belly, mark me. [Told as a fable, this is the belly’s answer to a complaint from the other members of the body that it received all the food but did no work.] In Coriolanus (1623), Act 1, Scene 1, line 130-141. Webmaster’s note: The Fable of the Belly has its roots in antiquity. William Harvey delivered a lecture in Apr 1616 on his discovery the circulation of blood in the body, but did not publish until 1628.